2. The school will always have emergency supplies of food and water. i. Until a general “all clear” statement is issued, students will not be permitted to leave campus without administrative consent or being accompanied by a parent or guardian. ii. No student will use the QCS telephone unless directed. Cell phones may be used with permission. I don't remember if any of the schools I've ever been to had an earthquake-preparedness clause in their Handbook. In an emergency response vacuum, the Quisqueya campus has become a center for relief. The first night many people slept on the soccer field, with the security of the school's wall to protect them, and the knowledge of availability of water. There are still staff and national workers living on the soccer field and one of the playgrounds is serving as temporary housing for children from a nearby orphanage. Immediately after the quake news came to the campus that a large grocery store nearby had collapsed. A group of teachers and staff went up the road and helped pull 34 people out of the rubble. That first morning, one lady who had been injured in the quake, a relative of a school employee, passed away. My sister wrote that it was "the saddest thing I'd ever seen." Tomorrow the school will host a medical team that will begin assisting the many injured people in the neighborhood. There will be a temporary hospital/operating room in the chapel and a trauma center on the basketball court. Steve Hersey, my brother-in-law, is the director of the school. He writes on the Quisqueya website: "We hope to be able to have a water and food distribution from our campus also." My sister and her family have fourteen people sleeping at their house. Last night they slept outside for fear of aftershocks. But for some reason their house has not been damaged structurally. That's significant when you consider that Steve writes that at least one-third of the buildings in their area are already demolished or will have to be. They are going to have many people relying on them over the next days and months. To donate directly to Quisqueya's happening-right-now expertise-on-the-ground community relief efforts, go to the Quisqueya website and click on donate at the bottom of the screen. In California Earth Quake preparedness is always a must at school. Every child in our school district has a "survival kit" prepared by the parents at the beginning of the school year. This includes a favorite non perishable snack, maybe a cool little toy, and a personal note of encouragement that can be given or read to the child until his parent can make contact with them. There were some other things we had to put in there too, but those are what I remember. 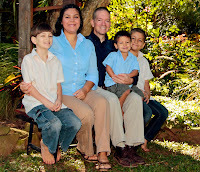 We live in rural Paraguay, South America, where we work with World Gospel Mission. We help train English-speaking missionares in Guarani language and Paraguayan culture through the Guarani-Jopara Institute for Missionaries.